This week, my post was going to be ... a glass of wine. How to open it, pour it, and drink it. And then I remembered, most people reading this already know how to do that. And do it well. So I decided not to waste your or my time. I've been to an Urgent Care or doctor's office 6 times in the last two weeks with one or both kids. So I've gotten VERY good at opening and drinking wine. I thought I could share my expertise, but again, unnecessary. 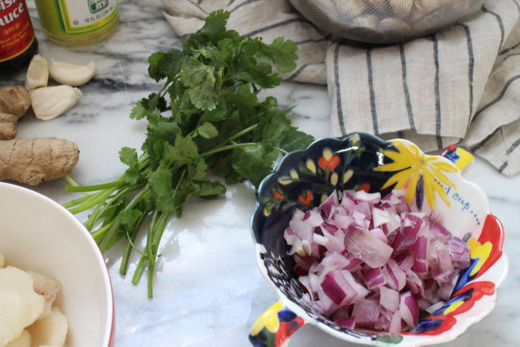 Lately, I've noticed a common theme among friends regarding the kitchen, cooking, hosting, prepping, serving. More often than not, folks are genuinely scared of cooking. I think more appropriately stated, they're scared of failing at cooking. The stakes are high when you make the decision to invite people over and serve them, or whip up dinner for your best friend, or even to spend the afternoon recipe-testing on your own. It can be expensive, it's definitely time consuming, and it will absolutely destroy a clean kitchen. Unless you're Type A or have a live-in housekeeper. It's anything less than perfect. It's a process. And it's really not scary. So, new mission. Make cooking less scary. For instance, this recipe is literally nothing more than adding a few things to a bowl and combining, cutting up some protein and vegetables, and throwing it all in a hot pan. Then spooning it all into a piece of crunchy lettuce. That's it. Not. So. Scary. Get it all in a pan. Watch it work for you. There's so much that fills me with fear. Bringing up two little ones in a world that's getting hotter and heavier with time? Anxiety inducing. Driving through a canyon in the rain at night, alone? Terrifying. But cooking? Especially home cooking? Nah. I'm not trying to be Anthony Bourdain, Nigella, Bobby... I won't pretend I belong in a professional kitchen. But I try every day. And if you can afford the time and groceries, you should try as often as you can as well. Even if it fails, who knows? You might enjoy it! Combine the soy sauce, hoisin sauce, rice vinegar, salt, and sugar in a small bowl and mix together until the sugar dissolves. Heat 1 tablespoon of the oil in a wok or deep pan over high heat. Stir-fry the garlic and ginger for 20-30 seconds. Add the onion, mushrooms, and water chestnuts and stir-fry for 2-3 minutes. 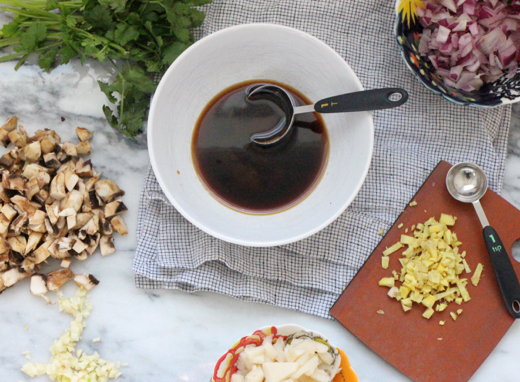 Remove the contents of the wok. Heat the remaining 2 tablespoons of oil in the wok. Swish the oil around, add the chicken, and brown for 2 minutes, or until no longer pink. Add the cooked vegetable mixture back to the wok, decrease the heat, and stir in the sauce mixture. Stir for 1 minute, or until the sauce is heated and the chicken is cooked through. Spoon the filling in equal amounts into the lettuce cups. 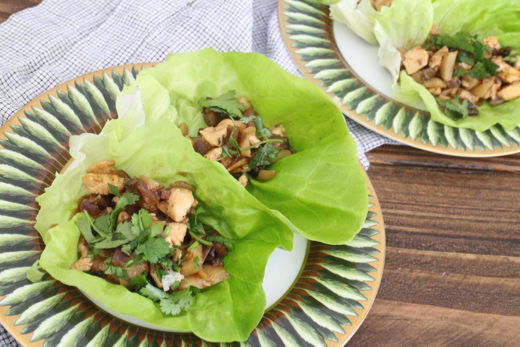 Top each lettuce cup with cilantro and sprinkle with chopped cashews. Serve warm.